As they say, age is just a number. I'm sure that's how Graham Bonnet may see it. At 68 years young, the legendary vocalist is going strong with a new band and a new album, The Book on the Frontiers Music. Now my recollection of Mr Bonnet dates me. I'm more familiar with his early work with Alcatrazz (No Parole for Rock n Roll (1983), Disturbing the Peace (1985), and Dangerous Games (1986)), Michael Schenker Group (Assault Attack (1982)), and Rainbow's Down to Earth (1979), which produced the hit single Since You've Been Gone. Honestly, I preferred the Dio years of Rainbow, and was never quite the fan of Bonnet or the Bonnet era sound of Rainbow for that matter. Needless to say, I haven't really followed his career. Nevertheless, The Book comes as a pleasant surprise. First, it's a two CD set with the first CD all new material, and the second re-recordings of some iconic Bonnet songs. As for the former and the new songs, what is quite self-evident is that Bonnet is still an exceptional songwriter and a strong vocalist. The music is typical of classic melodic hard rock, more Eighties style with a hint of a metal edge and then packaged in an AOR wrapper. The songs are lively with plenty of melody and groove, and loaded with catchy riffs, soaring leads, and mighty vocal arrangements. Which is Graham Bonnet's signature stamp upon most everything he does. Excellent examples come within Strangest Day, Rider, Earth's Child, and the simply marvelous Welcome To My Home. While most of those vocals come with energetic rock songs, Bonnet delivers smoother vocals on the anthem-like ballad. Moving on to the second set, the re-recordings are the most popular selections from the albums mentioned above. Now, it's been a long, long time since I've listened to any of those albums. Yet it's not difficult to remember the sound of All Night Long, Assault Attack, Desert Song or, of course, Since You Been Gone. It's like deja vu all over again. Bonnet and company make the classics feel fresh and vibrant for the new century. If you liked any of these tunes in the past, you will definitely enjoy the present day, throwback Thursday, editions. All in all, if you're Graham Bonnet fan or simply need a re-introduction to the voice and his music, The Book is a fine performance and a solid platter of classic melodic hard rock. Recommended. 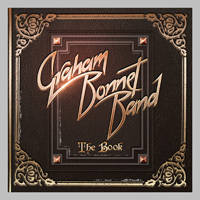 If you're Graham Bonnet fan or simply need a re-introduction to the voice and his music, The Book is a fine performance and a solid platter of classic melodic hard rock. Recommended.